Good morning, friends! We’re here in the last full week until babies and things are finally starting to take shape around here. We’re great procrastinators around here, which is terrible, but God is merciful and has kept our little boys inside and growing while we scramble to get done what probably should have been set up a while ago. Considering twins could just appear at any time, you’d think we’d have been on top of things long before now, but that’s kind of the weird thing about babies and baby showers. You can’t buy big things until you know someone else hasn’t gotten them for you already, so you wait until after the shower, but they tend to throw showers later in the pregnancy, so you can really only do so much until they’re over. 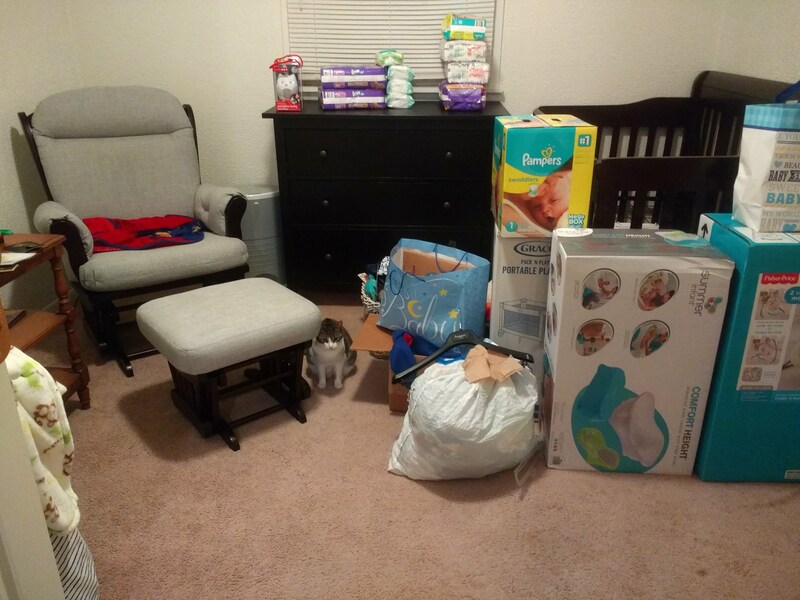 So now that we finally have all the things that would be given to us, we went out last week and got the rest of the furniture we needed and organizational things and got to work on turning the room full of stuff into a nursery. We started with chaos, as always. After the showers everything just sort of got shoved back into the nursery so it was out of the way. My mom was awesome enough to come down and help me sort through all the things and get them organized into bags of like objects so I could at least find what was around and we could wash all the many onesies and sleepers and socks that needed washing. Unfortunately, without the dresser or the closet organizer, there wasn’t really anywhere to put the stuff we’d sorted, so that’s as far as that could go until last week. We made an harrowing trip to Ikea to purchase things to get us organized properly. I was unaware just how terrifying Ikea is on a Saturday afternoon. It’s nuts! Logan has issues dealing with a lot of people in cramped spaces and there were a lot of people in a lot of cramped spaces. So we waded through people to grab all the things that we needed and then waited 45 minutes in line to check out. They actually started handing out cookies to people waiting in line because it was taking that long. We had planned to do so much with that Saturday, but by the time we got back we really didn’t have the energy to clean up more than a little bit of sorting in the bedroom. We at least managed to clear space for the bassinets, so that’s the big thing. This past weekend was filled with helpful people. My college roommate, Debbie, came to help actually get things up and organized and cleared so that there was space for the men coming on Saturday to put things together. We managed to de-tag a lot of clothing, fill a hamper, clear out the closet and start filling it with what will actually be living in there from now on. On Saturday we were blessed to have our friends Goose and Sterling over to assist in putting together the Ikea dresser we got and the crib that has been waiting patiently for weeks. Debbie came back to be bossy for me, because someone has to be bossy for me, I’m really really bad at it. So she took charge and we sorted clean clothes and organized the drawers once the dresser was put together and in place. She also brought a perfectly sized dowel rod for hanging the closet organizer that I got without actually checking if I could hang it up in our closet. Turns out I couldn’t, but Debbie fixed that, so it’s in place and ready to be filled with baby things! We made so much progress on Saturday that the room actually looks like a nursery now, instead of a room full of boxes and bags. Sterling helped us rearrange the furniture so that, hopefully, everything will fit in there. We’ll be getting the second crib today and Debbie and I are going out to look for more baby items that we need at the local Once Upon a Child. I’m super excited to actually buy things for our boys! Aside from the one book I haven’t personally bought anything for them yet. Unless you count the yarn that I made all the little hats and socks and things from. So I’m hoping to find a second wearable carrier and mirrors for the car and maybe some coming home outfits, if we have time. I’d like to get some little baskets to put things in for a living room changing station and snacks and such for my nursing station. Not sure how much we’ll get done, but that’s my list, for now. I feel like I go into outings more ambitious than is every reasonable, but that’s okay. I get to be pleasantly surprised if we managed to get all the things, but more often feel dumb when I get home and have forgotten half of what I meant to get. It’s a way of life. We are down to nine days until the birth of our boys. That’s not very many days, really. I can now see that it is supposed to be 50 degrees and sunny on the day we go in for our inducement. I can see my sons’ birthday on the 10 day forecast! I might be mostly excited that they’ll both finally be out of my ribs. I don’t understand why they feel they need to be up there, but they’re both into it now. Hopefully we’ll manage to get everything properly set up for them and all ready to go by next week for when we bring them home. If everything goes really well we could be home by Saturday. I will be writing Thursday and my final post next Tuesday and then I’m off until at least April. We’ll see how things are going after that. My mom has plans to come down at least once a week to help out and give me a break and my mom-in-law likewise has offered her day off to help me out so I may start with one day of blogging and see how that goes from there. We shall see! In the mean time, have a lovely day, my friends!